I've been walking five miles a day. Over the past week or two I've hit the pickleball court twice and the tennis court once. I appear to have hurt my left knee. That damn knee really does hurt, without any obvious trip or slip or strain, but I'm sure you'll agree that all of the above is a pretty positive lede for a guy with Stage 4 intrahepatic cholangiocarcinoma who couldn't hold down a bite of food a few weeks earlier. As crazy as it sounds, I feel good physically and even better emotionally. The forced "vacation" that is short-term disability is part of it, no doubt, but there's more. The psychology of borrowed time? I'm manic without depression, racing to tend to laundry and dishwasher chores, and often just deliriously happy for no good reason. My appetite is back with a vengeance, thanks in part to the steroids that come with the chemotherapy. Don't be surprised if the next entry here is a detailed analysis of Popeyes vs. KFC. 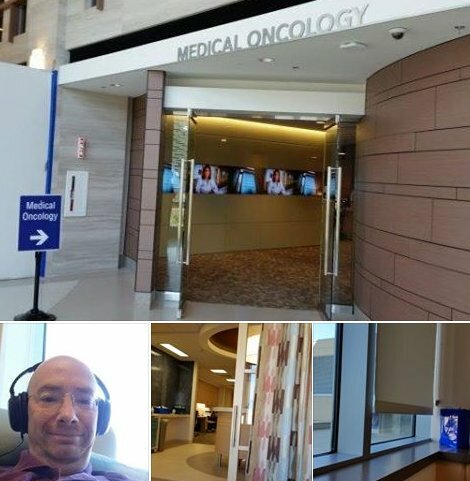 Now, my treatment is still in its first stage -- just chemo -- and it might be several weeks before the doctors stick me in the scan-o-tron to see whether the tennis-ball-size tumor in my liver has assumed more golf-ball-like proportions. But the anecdotal evidence sure doesn't suggest any move in the other direction. My blood tests aren't showing anything alarming under the circumstances. I'm still on an opioid (it's the American way! ), but the pain is minor, and it's almost always "referred" pain that presents itself as a backache, not a flashing YOUR TUMOR HERE! neon sign on my abdomen. A handful of things about my diagnosis have emerged as "lucky," and one of those is that it came just as Johns Hopkins was about to open a branch of its cancer center at Sibley Memorial Hospital, much closer to my home in Washington, D.C. The photos here are from my first visit to the new facility, with its private infusion rooms. This was the second and final infusion of Round 2 of chemotherapy -- a round is two visits in three weeks (infuse, infuse, rest). Five or six hours in a chair sounds boring, but I could sit there twice as long. It is truly a highlight of my week. The nurses are smart and capable and funny. I have my books and my music and my Jacqueline. And aside from a little fatigue, I've escaped the side effects: I've had no nausea since starting chemotherapy, and I still have all my hair! Soon we should be talking about the second stage of treatment, the tiny beads of radiation bombarding the big tumor directly. And in 40 years, give or take, they should be interviewing me for the documentary. Watching pickleball-tournament videos on YouTube is a great way to pass time in a hospital, btw. Wishing you the best as you fight this thing! This was a great read in every sense. Glad to hear you're in good spirits, feeling well under the circumstances, and have a good appetite! And really glad to hear you're not losing your hair! ;-) I have no idea what pickleball is but wonder if it's sweet, sour, or dill. I'll have to look that up. Thanks for sharing your experiences with the tribe--will continue to send good energy. Thanks for the updates, Bill. Keeping up with the positive thoughts in your direction. Good luck and hang in there, Bill! Keep it up! I can't wait to read the memoir when you're 100. This is the best news I've read all week, bar none. Thanks for telling us.